Truck on down to Gladesville and join the fiesta at Dos Senoritas, a poky restaurant that’s packed to the rafters almost every night. Sky-blue walls, sombreros and rainbow ponchos set the scene – the only thing missing is a mariachi band. It’s a popular spot for groups and kids on weekends, so dismiss any thoughts of a quiet, intimate dinner. Seating is also tight, so expect to make friends with the table next to you. Every table scores a complimentary basket of golden tortilla chips and a saucer of fiery salsa as soon as they sit down – a nice touch. Now, if you’ve ever wished that burritos came in XXL, then the Mac Daddy Burro ($25) is your dream come true. Leave your belt at home and put on your loosest pants – this is going to be a serious chow-down. 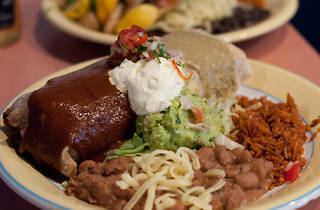 The Mac Daddy Burro is a behemoth of a meal, weighing in at over half a kilo. 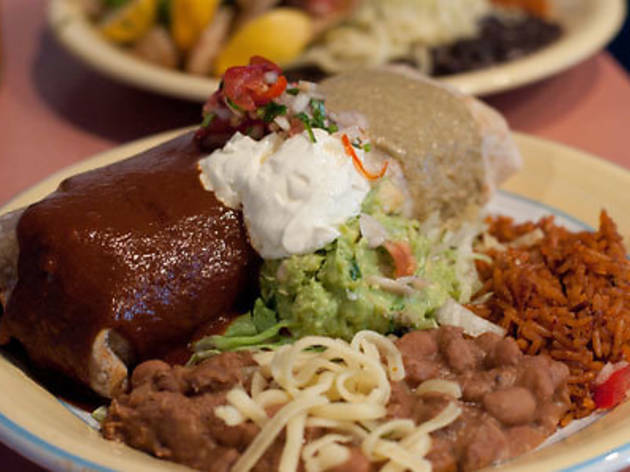 Choose your protein – pork chilli verde, shredded beef, shredded chicken or minced beef – and sit back and wait for the burrito bomb smothered in spicy salsa verde and mole oaxca, a dark chocolate sauce that is smoky and slightly bitter. Guacamole, sour cream and side serves of refried beans and Mexican rice will tide you over until at least lunchtime the next day. The street style tacos ($25 for three with rice and beans) are a cracker, especially the baja shrimp taco with fresh prawns. There are five types of fillings to choose from, each piled into a corn tortilla that has been grilled until slightly crisp. Chef Domingo Medina hails from Guadalajara, Mexico and is committed to bringing the authentic taste of real Mexican street food to Sydney. Hence there ain’t no cheese on these tacos – just a good smoosh of guacamole and plenty of fresh salsa. The supercheesygooeychimihanga ($23) is everything you need to raise your cholesterol – a pork and cheese grenade in a flour tortilla that is deep-fried and then served with jalapeno cream cheese and jack cheddar cheese. You’ll also find gringo philly steaks covered in cheese sauce ($23), chicken in mole oaxca dark chocolate sauce ($29) and traditional corn masa tamales wrapped in a corn husk ($29). Mexican beers (from $7) and Margaritas ($12) will keep the party going. Finish things off with a warm churros donut ($6) dusted with cinnamon and served with chocolate sauce. Yowza.